well, my gsd is five years old and i have noticed that very recently his testicles have been turning a really dark black colour with few pink patches, i was wondering what it could be and what to do about it. Would be greatful for you to answer as soon as possible. Thanks. Well, I certainly can't answer this question but I can offer you some advice - get your dog to a veterinarian as fast as you can to get this checked out. I have no idea what could cause that. 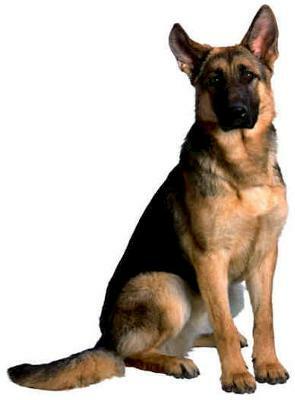 So don't wonder what is making that change happen, take your German Shepherd to the veterinarian and find out for sure. It may not be anything big at all but then again who knows and no one could tell you for sure other than a working veterinarian. I don't know about you but I'd rather be safe than sorry. And if it happens that you haven't taken your GSD to the vet in a while, then have the vet give him a thorough once over for everything else while you're there - Coat, ears, teeth, nails, eyes, joints, the whole nine yards. At 5 years of age your GSD is now entering his "middle age" so you definitely want to keep a tab on all physical changes he may be going through. Good luck with your boy and let us know what caused this change in the first place. For heaven sake, take your GSD to the vet now! Don't wait any longer, it may be nothing but you want to be sure, as the old saying goes, "better safe than sorry".